What's gorgeous and colorful and filled with all kinds of darling details? Today's styled shoot by Cakes and Kisses is all of that and then some. Perfect for a Spring or Summer celebration, this styled shoot truly had me at hello. Things to be on the lookout for: a beyond gorgeous lounge area, custom orchid place cards, and the sweetest little puppy trio I've ever seen. Also be sure to take a peek at the seriously sweet dessert display they created. In lieu of a full dessert bar, they creatively opted for a Sweet and Salty Bar, which surrounded the beautiful cake. And not to be forgotten, a signature drink, the “LGBTini”, a Lemonade Ginger Berry Tea. Oh, and I can't go without mentioning these blooms! I'm seriously blown away by all of this pretty! Beautiful details, gorgeous florals, and hello, did you see those cute little pups? Those cuties joined the festivities and were even pampered with their own beverage and snack station, which included chicken and bacon flavored water, and doggie treats. How darling is that? The wooden furniture provided the perfect canvas for the tablescape, which included bright cobalt blue vases filled with bright pink garden roses, tulips, ranunculus, sweet peas, azalea and of course, bougainvillea. From the Event Designer: “Our love story begins with two people. Regardless of gender, love exists and it is powerful. In our industry, the driving force behind any wedding is love.” And what's not to love about that? A big thanks goes out to everyone who made this styled shoot happen. So much creativity, so much inspiration, and so much color! All the things that I can't seem to get enough of! 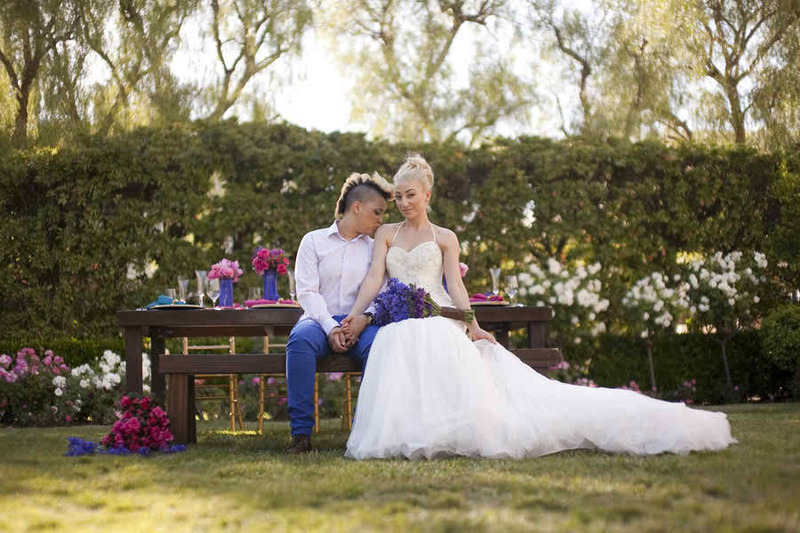 10 Comments " LGBT Styled Shoot | Modern, Colorful and Gorgeous "
My goodness are those flowers gorgeous! Everything about the wedding is stunning. The blues and pinks. The yorkies. The flowers. Amazing. Such a fabulous shoot! The colors are fantastic! Amazing color combination - that hot pink and bright blue are just dazzling! Gorgeous! I love the vibrant colors and the yorkies, of course! Everything about this shoot is so vibrant and pretty! These colors really pop! What a beautiful couple. Absolutely loving the vivid hues - the royal blue and fuchsia look incredible together! I love all of the bold colors and that bride's mohawk is AWESOME!! !